This is a short novel. I listened to an unabridged reading of it on a recent road trip, and the whole thing fit on three CDs. 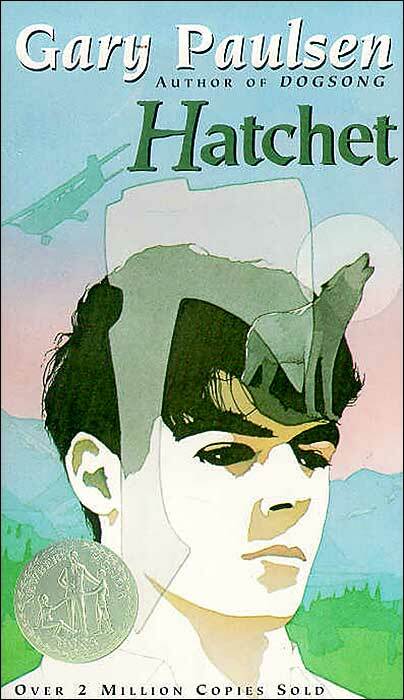 Hatchet is the story of thirteen-year-old Brian, a boy still coming to grips with his parents’ recent divorce and who must now divide his time between them. The novel begins with Brian boarding a tiny prop plane that will take him up into the Canadian wilderness where his father now lives and with whom he is to spend his summer vacation. Before Brian departs, his mother — who was the cause of the divorce — gives him a hatchet as a parting gift. When the pilot of the plane has a sudden and massive heart attack mid-flight, Brain must take the wheel and call for help. But help doesn’t come. And Brian crash lands the plane in the remote and unforgiving wilderness with only his hatchet to aid him. This is a survival story, of course, but one that is real and gut wrenching. Swiss Family Robinson this ain’t. Brain finds no easy answers. Like the movie Cast Away, Hatchet shows how one must tirelessly struggle to find the necessities of life. Building a fire. Not easy. Spearing fish. Not easy. Finding shelter. Not easy. And the wildlife are far more dangerous than cute PBS documentaries would lead us to believe. In short, this is an honest adventure story. One that will keep you turning pages (or listening to the CDs) as Brian struggles to stay alive. But it’s also a coming-of-age tale, one that explores the nastiness of divorce and it’s effects on the children involved. A great read. B.
I have read the first 3 chapters .